Joe Renwick, CCIE Director of Operations at M5 Hosting was a Top Tech Awards Nominee in 2016. 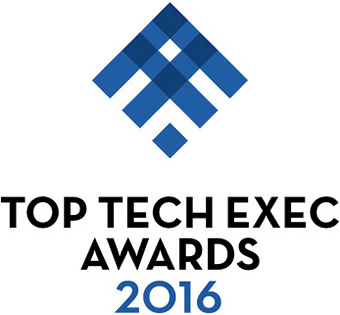 The Top Tech Exec Awards honor outstanding information technology executives who work in San Diego, as nominated by their peers and clients. M5 Hosting is a finalist for the 2016 Healthiest Companies Awards! This event recognizes organizations who have excelled in recruitment, retention, and the bottom line by creating environments where their employees flourish. This award presented by San Diego Business Journal. 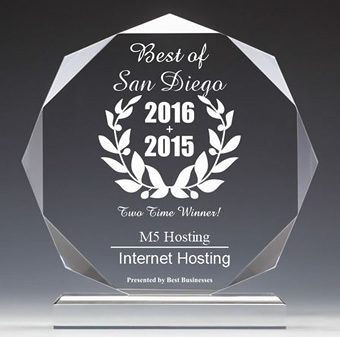 M5 hosting won the “Best of San Diego Internet Hosting Award” two years in a row, 2015 and 2016. This award is for excellence in marketing and customer service. The 2016 Best Businesses Winners were determined based on information gathered by Best Businesses and data provided by third parties. The Best Businesses of San Diego Award Program was established to recognize the best of local businesses in the San Diego community. The 2016 CorporateAmerica Boardroom Elite Awards selected M5 Hosting, Inc. as the “Best International Cloud Hosting Provider.” Corporate America invited their subscriber base of 254,000 and an additional 350,000 industry professionals to cast a vote. Through these awards, CorporateAmerica identifies and honors the most respected companies while recognizing and rewarding outstanding success, innovation and ethics across America’s business communities. The San Diego Business Journal recognizes the local industry leaders who have taken the lead in driving their businesses to great success. For 2016 and 2017, Michael J. McCafferty, CEO of M5 Hosting, Inc. was recognized as a Finalist for this award. 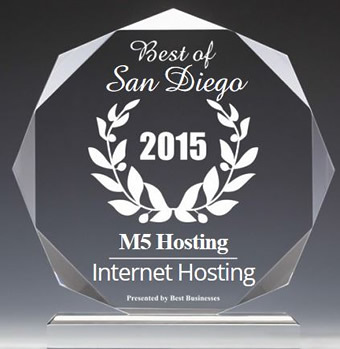 M5 hosting won the “Best of San Diego Internet Hosting Award” for 2015. This award is for excellence in marketing and customer service. The 2015 Best Businesses Winners were determined based on information gathered by Best Businesses and data provided by third parties. The Best Businesses of San Diego Award Program was established to recognize the best of local businesses in the San Diego community.